Can Straps solve a messy daily nuisance! 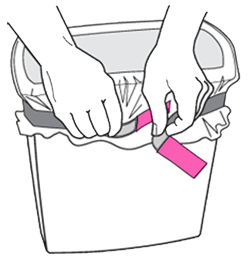 Can Straps® securely hold the open edge of the trash bin liner over the rim of the container. The bag stays in place even when it gets filled – and no garbage falls between the bag and the container. Much less mess to deal with! Whether for a home, business or property, let those who will be emptying the trash bins know that Can Straps are in use, and how they work. This will keep the straps from getting misused or accidentally discarded. In particular, tell building or grounds maintenance staff members, in order to avoid straps popping into the container by mistake when bags get changed. Typically janitors lift the liner by grasping its ends and pulling up, which can cause the straps to land inside the bag! When putting in a fresh bag, there is no need to tie one of those pesky, ill-fitting knots to hold it around the can. When connecting the strap ends, simply secure the hook & loop fasteners for the best fit around the container. No need to line them up exactly or pull tight. Press and compress waste to maximize the space in the bag and get the most use of every bag. Can Straps will hold it in place. Most organic waste will not smell if it is sealed from the air. Push down the waste as tightly as possible to remove any air. Then add paper or plastic waste (whatever can’t be recycled) and compress. By design, Can Straps can reduce odors since there will be no spillage between the bag and the inside of the container. Can Straps can be machine washed with regular laundry detergent, no bleach, in cold water. Tumble dry on medium or light setting, or hang/drape on something to air-dry. The strap material is made from approximately 90% Polyester fiber and 10% Lycra. These materials are very resistant to mold and absorption of water and will dry quickly on their own if placed so that air can circulate around them. Can Straps may shrink up to about 10%, however, the elasticity will compensate for that and they will still fit the cans.